I'm not sure how this is "biscotti." I thought biscotti was a type of Italian cookie thing, rather than a granola-esque cereal food. But nonetheless, with such an exotic name, how could I resist trying this product? I like biscotti. I like hazelnuts. And of course I like chocolate. It seems like a no-brainer. But in reality, it's more like a plain bowl of granola with some chocolate chips thrown in. 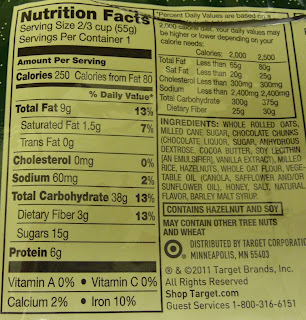 I see "hazelnuts" on the ingredients list, but if they were there, they were far and few between. But don't get me wrong, it's not bad. I'm also a fan of plain old granola in a bowl with milk. And adding chocolate to it only makes it better. 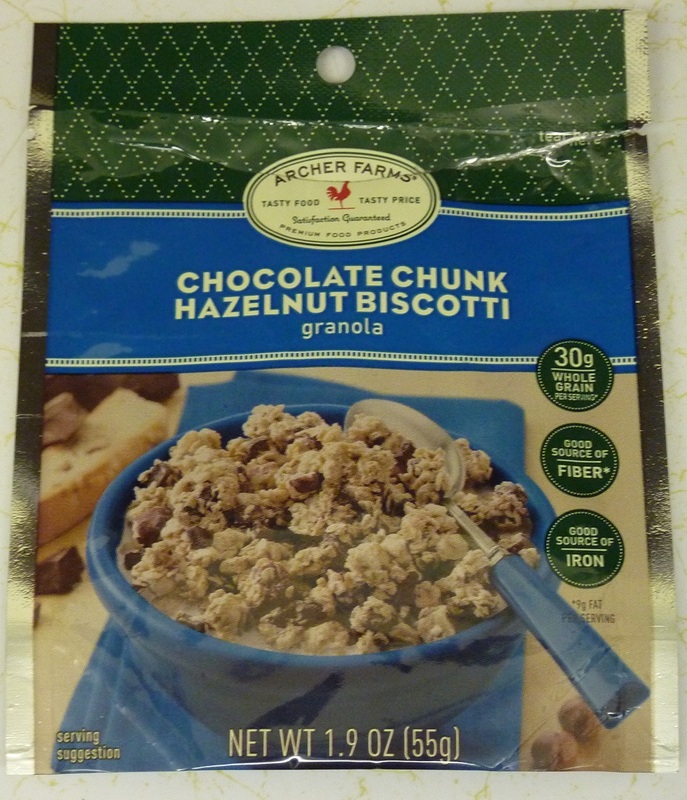 I guess my main complaint is that the title seems to flaunt some kind of exotic Italian import with gourmet nuts and cookies and gorgeous globs of confection, but what I got was...granola with chocolate chips. Those crafty Archer Farms marketers know what they're doing. They can take something painfully plain and make it seem like it came off the dessert menu at a Wolfgang Puck eatery. But the good news is that if you want to try this or any of the other kinds of Archer Farms' unique cereals, they make both a big box size that retails for something like $4, but they also sell a 99 cent single serving variety just so you can sample it before you commit to multiple breakfasts. That's what I bought. Just a little plastic bag's worth of cereal. 2/3 cup. That's barely enough for a full bowl. 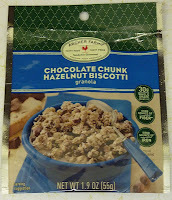 But it was enough to give me an idea of what this stuff's all about: granola with chocolate chips, and not much more. While the title of this product would suggest a score of 9 or 10, in reality, it only earns a 6 from me. I really enjoy the single serving bags too. I agree with you that this granola doesn't taste anything like I think a hazelnut biscotti would. I must say though, that this granola is delicious mixed into yogurt. I didn't try that, but I bet it would be good! I thought it was the best cereal I have ever tried! It was loaded with chocolate and there were plenty of hazelnuts. The granola was great too! I bought the big box of it at Target and I'm happy about this purchase! It really does taste like a dessert. 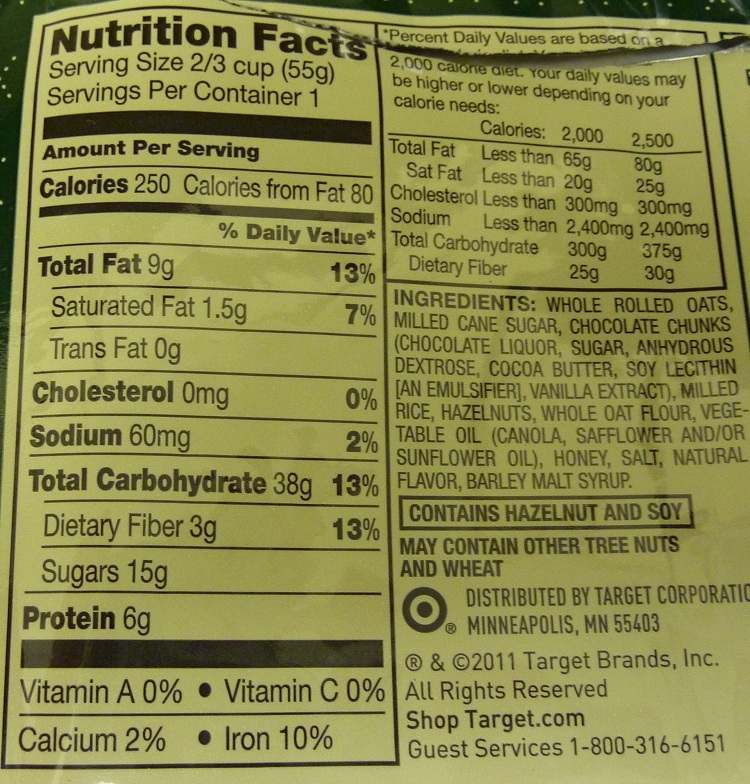 After i looked and saw the calories, sugar, and carbs... Its easy to see why it was so scrumptious! :( but totally worth it!! !